January was the hottest summer on record in Australia. Risk Frontiers’ Andrew Gissing spoke to the ABC about the impacts of heatwave conditions. In light of underwhelming progress at COP-24 (the annual United Nations Framework Convention on Climate Change (UNFCCC) Conference Of the Parties (COP) in Katowice 2018), it is increasingly improbable the Paris Agreement’s ambitions will be achieved. Instead, it seems more likely that recommendations from the Financial Stability Board (FSB) will be the primary catalyst for effective action on climate change mitigation. Projections of the economic cost of climate change have always been somewhat dire (e.g. Stern (2006)); and have been mostly ignored by policy makers. However, the FSB have recommended financial risks due to climate change should be disclosed by all publicly listed companies. This is driving the financial sector to seriously consider the implications of climate change, and the results are likely to be sobering. With an understanding of risk comes investor pressure to minimise the risk, and this may well drive mitigation efforts above and beyond those achieved via the ‘heads-of-state’ level Paris Agreement. Publicly listed companies are legally required to disclose material risks to their investors. This disclosure is especially relevant for banks, insurance companies, asset owners and managers when evaluating the allocation of trillions of dollars in investor capital. In 2017 the FSB released the final report of the Task Force on Climate-related Financial Disclosures (TFCD), which stresses that climate change is a material risk (and/or opportunity) that should be disclosed—preferably alongside other risks in annual reporting. The TFCD proposes a framework for climate risk determination and disclosure (Figure 1), where risk is classified into two main types: transitional and physical. Transitional risks are those that may impact business models through changing technologies and policies: examples would be a carbon tax, or stranded assets associated with redundant fossil fuel exploration and extraction. Physical risks are those associated with climate change itself: these could be chronic risks such as sea level rise, or acute risks such as more extreme storms, floods or droughts. While climate change is expected to impact most businesses, even current exposure and vulnerability is not being adequately disclosed by most organisations. The Australian Securities and Investment Commission (ASIC) report in 2018 looked at climate risk disclosure in Australian companies and found that very few were providing adequate disclosure, thereby exposing themselves to legal implications; and more importantly, by failing to consider climate change as a risk, were potentially putting investor capital at risk. Companies that are attempting to disclose climate risk are typically doing so inconsistently, and with high-level statements of little use for investor decision-making (ASIC 2018). Quantifying organisational vulnerability and risk under climate change is a non-trivial task. Adequate implementation of the TFCD recommendations will likely occur over a >5 year timeframe (Figure 2). Initially companies are expected to develop some high level information on general risk under climate change. As research progresses, disclosure should become more specific. Understanding risk in terms of weather and climate has long been of interest to the insurance sector, but is now something expected to be understood and disclosed by all sectors. The Actuaries Institute have recently developed The Australian Actuaries Climate Index, which tracks the frequency of occurrence of extremes in variables of interest, such as temperature, precipitation, wind speed and sea level. The index provides a general level of information drawn from a distribution of observed variability. However, climate change will cause a shift in the distribution of events, meaning this information is of limited use for projections. The relationship between a warming climate and the frequency of extreme weather events is likely to be complex and peril and location specific. Quantifying physical climate risk requires an understanding of the physical processes driving climate variability, the technical expertise to work with petabytes of available data, and the capacity to run regional climate models for dynamical downscaling—these skills are typically restricted to research organisations and universities. Risk Frontiers utilises these projections within its suite of natural catastrophe (Nat Cat) loss models to investigate how losses may change in the future under different climate scenarios. Risk Frontiers adapts these Nat Cat models, developed for the insurance industry over the past 30 or so years to assist decision makers in estimating and managing catastrophe risk, to assess the impact of projected changes in weather-related hazard activity due to climate change as well as changes in vulnerability and exposure (Walker et al. 2016). In November 2018, The Geneva Association reported on the benefits of the integration of climate science and catastrophe modelling to understand the impacts of climate change stating that “Cat modelling is more relevant than ever”. With Nat Cat models being the ideal tool for this type of analysis, Risk Frontiers is strongly positioned to address the need for climate risk disclosure. Figure 2 Milestones in the implementation of the TCFD (TFCD 2017). Denny Wan is the principal consultant of Security Express and a postgraduate researcher at the Optus Macquarie University Cyber Security Hub. He has deep expertise in cyber risk quantification. His research focuses on applying cyber insurance concepts to supply chain risk management. He is the chair of the Sydney Chapter for the Open Group FAIR cyber risk framework. Dr. Tahiry Rabehaja is a Software Engineer at Risk Frontiers and a Research Fellow at the Optus Macquarie University Cyber Security Hub with expertise in probabilistic modelling and Information Security. In November 2018, the Australian Prudential Regulation Authority (APRA) released Prudential Standard CPS 234 making the board of regulated entities accountable for ensuring the adequacy and sustainability of their information security program. APRA’s standard was published 9 months after the Notifiable Data Breach scheme came into effect in the first quarter of 2018. The CPS 234 comes into full force in July 2019 with a 12 month extension for third party supplier contracts until July 2020. Prudential Practice Guide CPG 234, expected to be updated in the first half of 2019, is the primary guidance for the implementation of this prudential standard. However, APRA has confirmed that it will not provide guidance or method for the classification of the materiality of an information asset. A structured approach to cyber risk quantification similar to the now mature natural catastrophe risk modelling or operational risk management is important to ensure the impartiality of the classification methods. promptly notify APRA of material information security incidents. 13. The Board of an APRA-regulated entity (Board) is ultimately responsible for the information security of the entity. The Board must ensure that the entity maintains information security in a manner commensurate with the size and extent of threats to its information assets, and wbles the continued sound operation of the entity. This reflects the fact that ensuring the information security of all information assets remains the responsibility of the regulated entity and that the Board is ultimately responsible for the information security of the regulated entity. A reasonable interpretation of APRA’s response is that the board is responsible for determining the materiality of information risk and adequacy of the controls. This interpretation is echoed by several commentators   . 15. An APRA-regulated entity must maintain an information security capability commensurate with the size and extent of threats to its information assets, and which enables the continued sound operation of the entity. As a result, the absence of a national cyber security standard or metric prompts the board to be responsible for eyeballing the materiality criteria and assess the sufficiency of their information security program under clause 13 and 15. This is where a structured cyber risk quantification approach is important to provide an objective and quantifiable implementation of the compliance program. Currently, Risk Frontiers is partnering with the Optus Macquarie University Cyber Security Hub to develop a model for cyber security risk, parallel to its extensive work in natural catastrophe and rare event modelling. The cyber model aims at forecasting potential losses from tangible cyber-attacks given the profile of the victim. Such a model would provide the required metric to assess the potential severities of Information Security breaches for the underlying company. This week the World Economic Forum again published its Global Risk Report. The report is based on a survey that accesses insights across the Forum’s vast network of business, government and community leaders. The report expresses rising concerns regarding climate inaction stating that: “of all risks, it is in relation to the environment that the world is most clearly sleepwalking into catastrophe”. The report further reiterates recent messages from the IPCC about the extent of the global struggle to restrict warming and the dire warning by the recent United States National Climate Assessment that without significant reductions in emissions, average temperatures could rise by five degrees Celsius by 2100. It is claimed that the disruption to the production and delivery of goods and services due to environmental disasters has risen by 29% since 2012, placing additional strain on the resilience of organisations and their customers. The growing threat of sea level rise and the rising population of coastal megacities globally was featured. Some 800 million people already live in cities vulnerable to sea level rise up to 0.5 metres. According to the World Bank, 70% of the largest cities in Europe are susceptible to sea level rise. The phenomena pose significant risks to properties and infrastructure, though the economic risk globally is concentrated in low-lying coastal areas with significant asset values. The report cites research that $14.1 Billion was lost from home values in parts of the US east coast due to sea level rise between 2005 and 2017. Cyber risk was also rated highly with both massive data fraud and theft, and cyber-attacks being among the top five risks in likelihood of occurrence. Interestingly, respondents expected that cyber risks would increase in 2019. The associated vulnerabilities of essential infrastructure were a concern given recent examples of hackers gaining access to the control rooms of some utility companies in the United States. For solutions, the report supports the need for action to rapidly decarbonize agriculture, energy, transport and industry to limit the rise of global temperatures and to establish plans for adaptation. The challenge of promoting proactive adaptation investment is, however, highlighted by citing statistics showing that spending on flood recovery is nine times greater than investment in flood mitigation. Interestingly the report offers advice on conceptualising the unimaginable through promoting a technique of imagining failure and then thinking why such a failure may have occurred. Doing so is known as “prospective hindsight” and according to psychologists enables us to anticipate a broader and more vivid set of problems. Risk Frontiers will continue to support our clients in addressing these top risks in 2019 through the continued licensing and development of our suite of natural hazard catastrophe loss models for Australia and New Zealand. Our partnership with the ARC Centre of Excellence for Climate Extremes will allow us to give our clients unique insights into how climate change may affect their business. Furthermore, we will continue our work on building a cyber loss model through the Optus Macquarie University Cyber Security Hub and in assisting Government clients to build safer and more resilient communities in partnership with organisations including the Bushfire and Natural Hazards Cooperative Research Centre. Analysis of fatalities attributed to Hurricane Florence in the US. Hurricane Florence impacted the US East Coast in September 2018 resulting in dangerous surf conditions, strong winds, storm surge and heavy rain producing significant flooding. The system made landfall over North Carolina as a Category 1 hurricane. While 1.7 million people received evacuation orders (The Independent, 2018), estimates of evacuees in shelters were around 30 thousand people (VOA, 2018), and total flood loss for residential and commercial properties in North Carolina, South Carolina and Virginia were estimated to be between $19 billion and $28.5 billion. Around 85 percent of residential loss is estimated to be uninsured (CoreLogic, 2018). This article aims to identify key circumstances and demographic factors common in those who lost their lives as a result of Hurricane Florence. We define a hurricane death as one which would not have occurred if the hurricane had not impacted, i.e. any death directly or indirectly caused by that hurricane. This includes deaths from the potential mechanisms of rain (e.g., filling a depression into which an individual may fall and drown) and its associated flooding (riverine, flash), storm surge, strong winds and high seas. It also includes deaths of persons carrying out activities specifically associated with the hurricane – e.g., taking measurements, preparing people, goods or buildings to evacuate or endure the event, and cleaning up after the event (e.g., an accident whilst running a generator that was required because strong winds from the hurricane have taken out the electricity supplies). Care needs to be taken with timing – for example, how long after a hurricane has passed should one attribute flood deaths to that hurricane? This will vary from one event to another and is best defined by the weather authorities as (e.g., for Australia) in the case of a tropical cyclone decaying to a tropical low which can produce rain long after the initial impact of the tropical cyclone. By searching through articles from numerous media outlets, we have identified 53 hurricane deaths. Where possible, records were verified against multiple news sources. We also classified each record by the state and county in which the death occurred, 10 year age bracket, and by category of cause of death (e.g., deaths occurred while in a vehicle, deaths caused by falling debris). The results are also compared with previous research on fatalities associated with Australian Tropical Cyclones by Coates, et al. (2017). The most common circumstances that caused fatalities were related to vehicles (n=26, 49%) and flooding (n=23, 43%). Only one vehicle incident causing multiple deaths was identified. Fourteen (26%) fatalities resulted from vehicles being washed off roads and nine (17%) from vehicles colliding with obstacles due to water on the road causing aquaplaning or heavy rain causing low visibility. Most incidents involved only private vehicles, but two people died when a prison transport van was driven into floodwater and one person died driving a semi-trailer truck which aquaplaned, left the road and struck an undescribed obstacle. Only two flooding related fatalities were not also related to vehicles: a child playing in water which was deeper than normal due to preparatory release from a dam and a man who refused mandatory evacuation and was subsequently trapped in a caravan trailer. Four people died as a result of a tree falling on their residence or vehicle during the hurricane, while other debris related circumstances included vehicle striking fallen tree, tree falling during clean-up operations and a woman who died after suffering a heart attack as emergency services could not get to her due to debris on roads. Two people died from carbon monoxide poisoning while running a generator indoors due to power outages, while other circumstances relating to death included loss of power for an oxygen concentrator and electrocution while attempting to connect extension cords to a generator in heavy rain. Two people died in a house fire which was caused by candles used after a loss of power. Two people fell from ladders and another person suffered unspecified injuries while cleaning debris from the storm or making repairs. Three people died in circumstances relating to evacuation, one of whom fell while packing for evacuation, one on a moped while evacuating and one who fell and struck his head in a hotel to which he had evacuated. Victims were most commonly 70 years old and above. No deaths were recorded for people between 10 and 19 years old, but there were a few fatalities under 10 years old. The deaths of those under 10 years old were caused primarily by trees falling on homes, and being in cars that were driven into floodwater by an accompanying adult. Figure 1 shows fatalities in 10-year age categories as a percentage of all fatalities where age was reported. Males represented 74% of the deaths where the gender of the deceased was specified; however, a higher proportion of females died in circumstances relating to vehicles (58%) compared to males at 35%. More males died in circumstances relating to preparing for, activities during, and clean-up after the event such as checking on possessions, setting up generators, swimming in dangerous conditions or clearing debris. The consequences of Hurricane Florence provide a clear reminder of the dangers associated with driving vehicles during and after severe weather, and the importance of avoiding driving through floodwater. Severe weather is shown to increase risks associated with evacuating by vehicle. Figures 2 and 3 compare key demographics between fatalities from Hurricane Florence and a historical analysis of fatalities due to tropical cyclones in Australia from 1970 to 2015 by Coates, et al. (2017). Our analysis of deaths resulting from Hurricane Florence demonstrates a consistent gender distribution with Australian historical data. This supports the conclusion that males are more likely to be in hazardous situations or undertake risky behaviours than females in these types of events. However, the two data sets differ markedly in age demographics, with much younger victims in Australia than Hurricane Florence. Coates, L., Haynes, K., Radford, D., D’Arcy, R., Smith, C., van den Honert, R., Gissing, A. 2018. An analysis of human fatalities from cyclones, earthquakes and severe storms in Australia. Report for the Bushfire and Natural Hazard Cooperative Research Centre. Mingzhu Wang, Lucinda Coates and Thomas Mortlock. In 2018, Queensland had the third-warmest spring and forth-warmest November on record, in terms of mean temperature (BoM, 2018d). At the end of November, exceptional heat affected eastern Queensland, with some locations reaching their highest annual maximum temperatures ever recorded. Wildfires raged across central Queensland and more than 140 fires were burning throughout the State during the last week of November (BoM, 2018d), due to a combination of the prolonged heatwave and other “unprecedented” conditions. More than a million hectares have been burnt out, with 15 dwellings and more than 60 sheds or other structures being reported as damaged (Caldwell, 2018). Given the human population in the affected area, casualties were light: one man died after being hit by a falling tree while clearing a firebreak at Rolleston in the Central Highlands. All the threatening fires were contained by 5 December, with weather conditions easing due to severe storms sweeping across Queensland. Figure 1 shows all the fire hotspots for Queensland from 26 November to 5 December. Extreme heatwave conditions started developing in far north Queensland from 23 November 2018, and then spread across the north-east and central regions of the State (Figure 2). This heatwave was unusual as the temperatures were 5-10 °C above the November average, the humidity was exceptionally low for this time of year and the extreme hot conditions extended over a much longer period than “usual” heatwaves. The above-average temperature and unseasonally dry and hot westerly winds led to severe to locally extreme fire danger over large parts of eastern Queensland. 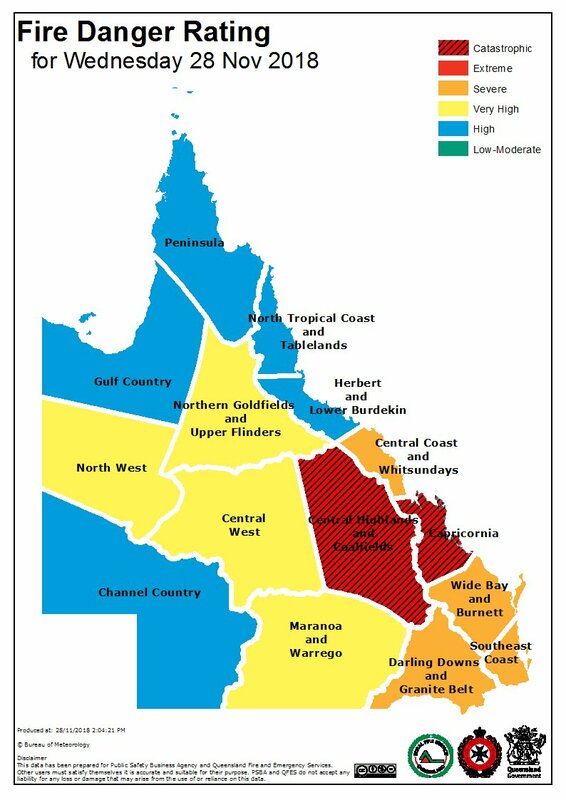 The fire danger conditions peaked on 28 November, reaching a catastrophic level for the Capricornia, Central Highlands and Coalfields regions (Figure 3). Cairns hit 42 °C two days (27 & 28 November) in a row, which are the hottest days on record for the region in November. According to Phoenix fire simulation technology (Figure 4), about 8,000 residents needed to be evacuated from Gracemere, west of Rockhampton. The town was subsequently saved, using a combination of water bombing aircraft and fire-fighting crews on the ground. Another significant bushfire originating in the Deepwater National Park on the central Queensland coast burnt out more than 17,000 hectares and forced hundreds of people to evacuate (Figure 5). This Deepwater blaze was extremely dangerous due to erratic wind direction changes, high fuel loads and low humidity, having a 66-kilometre perimeter and flames up to 10 metres in height (Ferrier et al., 2018). Comparison with previous bushfire events in Queensland in Risk Frontiers’ natural hazards database (PerilAUS) show that bushfire events around Brisbane, in 1994, also occurred after a heatwave. However, no event in PerilAUS has ever covered such a vast expanse of Queensland as this recent one. And there have been relatively few properties lost in any previous fires. As discussed in our Briefing Note 381, a heavy rain event on 28 November affected the Illawarra, Sydney Metropolitan and Central Coast areas in New South Wales. At the same time, Queensland was suffering extreme heatwave and fire danger conditions (Figure 6). Sarah Fitton of BoM indicated these two contrasting events were driven by connected systems (Doyle, 2018). Figure 7 shows that the abnormal westerly flow to the north of the low was responsible for the catastrophic fire danger ratings along the tropical QLD coast and it extended down into the low-pressure system across the New South Wales south coast. The two events were linked and influencing each other. The low over New South Wales was pushing warm air and stronger winds to Queensland through the connected system, intensifying fire danger conditions (Yeo, 2018). When considering these recent fire events in Queensland, it is clear that the catastrophic fire risk is substantially influenced by record extreme weather events. Clarke et al. (2012) has shown increased fire weather conditions in Australia since the 1970s. Unprecedented conditions may become a new normal and peril factors correlating together can worsen local situations. Risk Frontiers is currently building a new bushfire model using the latest remote sensing technologies and machine learning models. This model, along with Risk Frontiers’ loss models for other meteorological disasters, will soon be correlated on the Multi-Peril Workbench to better price cascading hazards. Bureau of Meteorology [BoM] (2018a), Australian daily maximum temperature extreme area maps, available at http://www.bom.gov.au/cgi-bin/climate/extremes/extreme_maps.cgi, accessed 08/12/18. Bureau of Meteorology [BoM] (2018b), Heatwave Service for Australia, available at http://www.bom.gov.au/australia/heatwave/, accessed 27/11/18. Bureau of Meteorology [BoM] (2018c), Latest colour mean sea-level pressure analysis, available at http://www.bom.gov.au/australia/charts/synoptic_col.shtml, accessed 29/11/18. Bureau of Meteorology [BoM] (2018d), Queensland in November 2018: Exceptional heat along the east coast at the end of the month, available at http://www.bom.gov.au/climate/current/month/qld/summary.shtml, accessed 08/12/18. Bureau of Meteorology, Queensland [BoM_QLD] (2018), Fire Danger Rating, available at https://pbs.twimg.com/media/DtEJBfxX4AMVgg-.jpg, accessed 27/11/18. Caldwell, F. (2018), Almost $1 million in hardship grants paid to bushfire victims, The Sydney Morning Herald, available at https://www.smh.com.au/politics/queensland/almost-1-million-in-hardship-grants-paid-to-bushfire-victims-20181205-p50kes.html?ref=rss&utm_medium=rss&utm_source=rss_feed, accessed 08/12/18. Doman, M. (2018), From space, the ferocity of Queensland’s bushfires is revealed, ABC, available at https://www.abc.net.au/news/2018-12-08/from-space,-the-ferocity-of-queenslands-bushfires-is-revealed/10594662, accessed 08/12/18. Doyle, K. (2018), Sydney weather and Queensland bushfire extremes have a common thread, ABC, available at https://www.abc.net.au/news/2018-11-28/sydney-weather-and-queensland-bushfires-linked/10561792, accessed 08/12/18. Ferrier, T., Layt, S., & Kohlbacher, S. (2018), The Australian, available at https://www.theaustralian.com.au/news/latest-news/locals-flee-as-qld-blaze-threatens-homes/news-story/ea2cf27bd8aa724b380d71177bf7fc6c, accessed 08/12/18. Geoscience Australia (2018), Historic Hotspot data, available at https://sentinel.ga.gov.au/#/, accessed 08/12/18. Sentinel Hub (2018), EO Browser, available at https://apps.sentinel-hub.com/eo-browser/?lat=-24.2823&lng=151.7881&zoom=11&time=2018-11-26&preset=2_FALSE_COLOR&datasource=Sentinel-2%20L1C, accessed 08/12/18. Yeo, C. (2018), Sydney storms could be making the Queensland fires worse, The Conversation, available at https://theconversation.com/sydney-storms-could-be-making-the-queensland-fires-worse-107789, accessed 08/12/18. Sydney Harbour beach erosion – actions of the sea or stormwater runoff? The heavy rain event on 28 November 2018 caused widespread flooding in the Illawarra, Sydney Metro and Central Coast areas, with some suburbs experiencing up to 61 mm in 30 minutes in Mosman, over 100 mm in two hours in the Sydney CBD and lower north shore, and 130 mm in 24 hours in Mosman. This type of springtime flash flooding is not uncommon, but is often associated with urban surface water flooding, and not coastal erosion. From a coastal perspective, it raises an interesting question for erosion of Sydney’s North Shore and Middle Harbour beaches. These areas include some of Sydney’s most expensive residential and commercial property, and are usually regarded as protected, low wave energy beach locations with minimal erosion risk. However – as demonstrated over the past few days – erosion can occur at these locations, and not necessarily due to waves from the seaward side but from urban stormwater runoff from the landward side (or to complicate things, a combination of both). The primary cause of erosion and consequential infrastructure damage can be important with regards to insurance against ‘actions of the sea’. The 28 November rain event developed from a NW-SE oriented trough over the continent, with several low-pressure cells developing 1 – 2 days prior to 28 November (Figure 1, A – C). The deepest of these was centered over coastal NSW, reaching a moderate 994 hPa by the morning of 28 November (Figure 1, D). The first front and associated rainfall (blue dotted line in Figure 1) passed over the Sydney Harbour area in the early morning of 28 November (6 to 8 AM). There was a maximum of 130 mm of rain in Mosman and 111 mm at The Rocks (Observatory Hill) – more than a month’s volume for these areas. A second front affected Western Sydney in the afternoon of 28 November (Figure 1 F) but did not significantly impact habour beach locations. Winds were not a key feature of this event and peaked a few hours after the most intense rainfall was experienced on the North Shore – reaching just below 50 km/hr at 10:30 AM on 28 November (BoM Observatory Hill, BoM 2018b). As the low-pressure cell moved offshore (Figure 1, G – H), rain and wind dropped while wave heights at the open coast began to rise (Figure 1). Observations at the Sydney wave buoy, located approximately 30 km off Narrabeen on Sydney’s Northern Beaches, show waves from the SE peaked in the late afternoon of 28 November, with maximum wave heights reaching between 7 and 10 m (Figure 2). Figure 1. Synoptic evolution of the 28 November 2018 rain event in 6-hourly intervals from 11 AM on 27 November to 5 AM on 29 November. Images modified from BoM (2018a). Figure 2. Wave height and direction observed at the Sydney wave buoy off Narrabeen through the 28 November rain event. Source: Manly Hydraulics Lab (2018). The 28 November event was an East Coast Low (ECL) – but not the type normally associated with coastal erosion. It developed from a continental / inland trough low, typical of a spring-time ECL (Browning and Goodwin, 2013), whereas most highly erosive ECLs occur in the winter months and have a more meridional (shore-parallel) track. The severe weather, while very intense was short lived because of the steady movement of the low. The heavy rain was driven by intense thunderstorms that formed in the northwest of the Sydney Basin and tracked southeast. According to design rainfall depths, there is only a 1 % chance of this intensity of rainfall on the Lower North Shore (up to 61 mm in 30 minutes in Mosman) occurring in any one year (ARR, 2016). The intense rainfall was probably a result of cooler-than-normal land surface temperatures on the coast and relatively mild ocean temperatures, resulting in strong convection and rainfall (Browning pers. comms.). This particular event had the characteristics of an extra-tropical cyclone and was driven by the dynamics of the upper atmosphere in a similar way to the mechanism for classic ECL development. Rain and wind were to the south of the centre of the low with clear sky and westerlies to the north. It was a very unusual weather pattern for late November – the abnormal westerly flow to the north of the low was responsible for the record maximum temperature along the tropical QLD coast and catastrophic fire danger ratings. It’s very hard to get strong surface westerlies at these latitudes at this time of the year. The reason for this may be the unusual amount of Antarctic sea ice for this time of year (Goodwin, pers. comms. ), which acts to displace the atmospheric cells in the Southern Hemisphere equatorward. In Sydney Harbour, the main cause of beach erosion was urban stormwater runoff (overland and drainage), not waves – an important distinction for insurance. Balmoral Beach in Mosman is a good example of the vulnerability of these largely protected, low wave energy coastal sites to this type of erosion. A steep, urbanized hinterland directly behind the beachfront led to high flow volumes running down several ‘urban rivers’ towards the beach (Figure 3). This washed out beach sand from the landward side, causing flooding and some significant erosion in places (Figure 4). Figure 3. Conceptual plot of stormwater runoff-induced erosion at Balmoral Beach on 28 November 2018. Erosion hotspots correspond to lowest drainage points. Inset shows an example of an ‘urban river’ down a steep catchment in Neutral Bay. It is possible for beaches in Middle Harbour to experience wave-driven coastal erosion. If wave heights outside Sydney Harbour are large, and the wave direction is from the SE, wind-waves can refract into Middle Harbour beaches and cause erosion. Interestingly, even beaches deeper in the harbour can experience erosion during ECLs without being directly exposed to the ocean wind waves. This (hypothetically – not tested) occurs through the propagation of infragravity wave energy – very long period, low amplitude waves that can bounce off headlands to reach otherwise protected locations. This type of wave energy is not detected by conventional wave buoys and is often associated with phenomena such as surf-beat or tsunamis. An example of this was during the April 2015 ECL, when Clontarf Beach – located deep inside Middle Harbour next to Spit Bridge – suffered severe erosion which may have been related to infragravity waves. Figure 4. Erosion at Balmoral Beach caused by stormwater runoff. The beach level used to be at the height of the drainage covers in (A). Photos taken by author on 29/11/18. Springtime ECLs are most commonly associated with flash flooding, and not coastal erosion because of the predominantly zonal track and limited wind and wave component of these events. 28 November, however, was a reminder that coastal erosion is not just caused by ‘actions of the sea’ but can result from a combination of heavy rainfall and a steep, urbanized hinterland. Fortunately, this type of rainfall is often localized – but it can lead to beach loss and infrastructure damage in some surprising places. Risk Frontiers is currently building an East Coast Low loss model to assist insurers to price risk during these types of events. Australian Rainfall Runoff [ARR] (2016), Design Rainfalls, available at http://www.bom.gov.au/water/designRainfalls/revised-ifd/?year=2016, accessed 30/11/18. Browning, S. and Goodwin, I.D. (2013), Large scale influences on the evolution of winter subtropical maritime cyclones affecting Australia’s east coast. Monthly Weather Review, 141, 2416-2431. Bureau of Meteorology [BoM] (2018a), Latest colour mean sea-level pressure analysis, available at http://www.bom.gov.au/australia/charts/synoptic_col.shtml, accessed 29/11/18. Bureau of Meteorology [BoM] (2018b), Latest weather observations for Sydney – Observatory Hill, available at http://www.bom.gov.au/products/IDN60801/IDN60801.94768.shtml, accessed 29/11/18. Manly Hydraulics Lab [MHL] (2018), Sydney offshore wave height, period and direction, available at https://www.mhl.nsw.gov.au/data/realtime/wave/Buoy-syddow, accessed 29/11/18. The U.S. federal government on Friday 23 November released a long-awaited report (NCA4) with an unmistakable message: the effects of climate change, including deadly wildfires, increasingly debilitating hurricanes and heat waves, are already battering the United States, and the danger of more such catastrophes is worsening. The report’s authors, who represent numerous federal agencies, say they are more certain than ever that climate change poses a severe threat to Americans’ health and pocketbooks, as well as to the country’s infrastructure and natural resources. And while it avoids policy recommendations, the report’s sense of urgency and alarm stands in stark contrast to the lack of any apparent plan from President Trump to tackle the problems, which, according to the government he runs, are increasingly dire. The congressionally mandated document, the first of its kind issued during the Trump administration, details how climate-fueled disasters and other types of changes are becoming more commonplace throughout the country and how much worse they could become in the absence of efforts to combat global warming. The Fourth National Climate Assessment (NCA4) contains two volumes. Volume II draws on the founda­tional science described in Volume I, the Cli­mate Science Special Report (CSSR). Volume II focuses on the human welfare, societal, and environmental elements of climate change and variability for 10 regions and 18 national top­ics, with particular attention paid to observed and projected risks, impacts, consideration of risk reduction, and implications under dif­ferent mitigation pathways. Where possible, NCA4 Volume II provides examples of actions underway in communities across the United States to reduce the risks associated with cli­mate change, increase resilience, and improve livelihoods. The report concludes that Earth’s climate is now changing fast­er than at any point in the history of modern civilization, primarily as a result of human activities. The impacts of global climate change are already being felt in the United States and are projected to intensify in the future—but the severity of future impacts will de­pend largely on actions taken to reduce greenhouse gas emissions and to adapt to the changes that will occur. The following summary information is excerpted from the report. The following scientific advances have been made since the previous assessment (NCA3) in 2014. Detection and Attribution: Significant advances have been made in the attribution of the human influence for individual climate and weather extreme events. Extreme Events and Atmospheric Circulation: How climate change may affect specific types of extreme events in the United States and the extent to which atmospheric circula­tion in the midlatitudes is changing or is projected to change, possibly in ways not captured by current climate models, are important areas of research where scientific understanding has advanced. Localized Information: As computing resources have grown, projections of future climate from global models are now being conducted at finer scales (with resolution on the order of 15 miles), providing more realistic characterization of intense weather systems, including hurricanes. For the first time in the NCA process, sea level rise projections incorporate geographic variation based on factors such as local land subsidence, ocean currents, and changes in Earth’s gravitational field. Ocean and Coastal Waters: Ocean acidification, warming, and oxygen loss are all increas­ing, and scientific understanding of the severity of their impacts is growing. Both oxygen loss and acidification may be magnified in some U.S. coastal waters relative to the global average, raising the risk of serious ecological and economic consequences. Rapid Changes for Ice on Earth: New observations from many different sources confirm that ice loss across the globe is continuing and, in many cases, accelerating. Since NCA3, Antarctica and Greenland have continued to lose ice mass, with mounting evidence that mass loss is accelerating. Observations continue to show declines in the volume of mountain glaciers around the world. Annual September minimum sea ice extent in the Arctic Ocean has decreased at a rate of 11%–16% per decade since the early 1980s, with accelerating ice loss since 2000. The annual sea ice extent minimum for 2016 was the second lowest on record; the sea ice minimums in 2014 and 2015 were also among the lowest on record. Potential Surprises: Both large-scale shifts in the climate system (sometimes called “tip­ping points”) and compound extremes have the potential to generate outcomes that are difficult to anticipate and may have high consequences. The more the climate changes, the greater the potential for these surprises. Climate change is altering the characteristics of many extreme weather and climate-related events. Some extreme events have already become more frequent, intense, widespread, or of longer duration, and many are expected to continue to increase or worsen, presenting substantial challenges for built, agricultural, and natural systems. Some storm types such as hurricanes, tornadoes, and winter storms are also exhibiting changes that have been linked to climate change, although the current state of the science does not yet permit detailed understanding. Individual extreme weather and climate-related events—even those that have not been clearly attributed to climate change by scientific analyses—reveal risks to society and vulnerabilities that mirror those we expect in a warmer world. Non-climate stressors (such as land-use changes and shifting demograph­ics) can also amplify the damages associated with extreme events. The National Oceanic and Atmospheric Administration estimates that the United States has experienced 44 billion-dollar weather and climate disasters since 2015 (through April 6, 2018), incurring costs of nearly $400 billion (https://www.ncdc.noaa.gov/billions/). Key Message 1: Adaptation Implementation Is Increasing Adaptation planning and implementation activities are occurring across the United States in the public, private, and nonprofit sectors. Since the Third National Climate Assessment, implementation has increased but is not yet commonplace. Key Message 2: Climate Change Outpaces Adaptation Planning Successful adaptation has been hindered by the assumption that climate conditions are and will be similar to those in the past. Incorporating information on current and future climate conditions into design guidelines, standards, policies, and practices would reduce risk and adverse impacts. Key Message 3: Adaptation Entails Iterative Risk Management Adaptation entails a continuing risk management process; it does not have an end point. With this approach, individuals and organizations of all types assess risks and vulnerabilities from climate and other drivers of change (such as economic, environmental, and societal), take actions to reduce those risks, and learn over time. Key Message 4: Benefits of Proactive Adaptation Exceed Costs Proactive adaptation initiatives—including changes to policies, business operations, capital investments, and other steps—yield benefits in excess of their costs in the near term, as well as over the long term. Evaluating adaptation strategies involves consideration of equity, justice, cultural heritage, the environment, health, and national security. Key Message 5: New Approaches Can Further Reduce Risk Integrating climate considerations into existing organizational and sectoral policies and practices provides adaptation benefits. Further reduction of the risks from climate change can be achieved by new approaches that create conditions for altering regulatory and policy environments, cultural and community resources, economic and financial systems, technology applications, and ecosystems. USGCRP, 2017: Climate Science Special Report: Fourth National Climate Assessment, Volume I. Wuebbles, D.J., D.W. Fahey, K.A. Hibbard, D.J. Dokken, B.C. Stewart, and T.K. Maycock, Eds. U.S. Global Change Research Program, Washington, DC, USA, 470 pp. USGCRP, 2018: Impacts, Risks, and Adaptation in the United States: Fourth National Climate Assessment, Volume II: Report-in-Brief [Reidmiller, D.R., C.W. Avery, D.R. Easterling, K.E. Kunkel, K.L.M. Lewis, T.K. Maycock, and B.C. Stewart (eds.)]. U.S. Global Change Research Program, Washington, DC, USA, 186 pp. Twenty-eight years on from the First Assessment Report in 1990, the IPCC’s most recent Special Report on Global Warming delivers an urgent warning to policymakers that we are reaching the point of no return for mitigating anthropogenic impacts on global warming and associated climate change. The report has divided opinion in Australia and further highlights the discord between climate science, economics and politics nationally. The report finds that limiting global warming to 1.5°C would now require rapid and unprecedented change in all aspects of society. The report highlights that we are already seeing the consequences of 1°C of global warming through more extreme weather, rising sea levels and diminishing Arctic sea ice. While 1.5°C may seem a small increase, it is how changes in mean temperatures are related to extreme weather events that is important. A small increase in the mean temperature also shifts the tails of the distribution, meaning it may impact extreme weather events that are temperature-dependent. However, any relationship between increasing mean global air temperature and extreme weather will be complex, and both peril and location-dependent. As an industry partner of the ARC Centre of Excellence, Risk Frontiers are looking to couple their cat modelling infrastructure to downscaled climate change projections to model the impacts on a peril-by-peril basis for business. A day after the IPCC report was published, the Royal Swedish Academy of Sciences awarded William Nordhaus and Paul Romer the Nobel Memorial prize for economics for their work on climate change and economic growth. Since the 1970s, Prof. Nordhaus has been warning governments that their economic models were not properly taking into account the impact of global warming. Similarly, Prof. Romer developed the “endogenous growth theory”: the notion that countries can improve their underlying performance if they concentrate on supply-side measures such as research and development, innovation and skills. He argues that the creation and spread of ideas – whether that be around climate change or otherwise – is necessary for economic growth. Understanding the economic costs of climate-related damages is essential to answering the question of how much society should be willing to pay to avert that damage (The Economist, 2018). Prof. Nordhaus’ work addresses this issue by modelling the economic harm of carbon emissions, thus allowing him to estimate the likely economic costs of the different IPCC Representative Concentration Pathways (RCPs). The IPCC report is published at a time of international discord on climate mitigation, with most scientists acknowledging that the likelihood of achieving a plateau at the proposed 1.5 °C is very small. This is essentially a reflection on the myopic nature of global political institutions, and the opposing long-term nature of the problem at hand. The global impasse on mitigation efforts only serves to highlight the importance of climate change adaptation planning and risk management in Australia. We’ll need to continue to adjust to the effects of climate change in the absence of addressing the underlying sources, but, ideally, we’d do both. If we believe the economics of the two most recent Nobel prize recipients, this may not be as costly as we think. APRA (2017). Australia’s new horizon: climate change challenges and prudential risk. Geoff Summerhayes, Executive Member – Insurance Council of Australia Annual Forum, Sydney. BBC News (2018). How Australia’s extreme heat might be here to stay. BBC News article by Adam Morton, Hobart, 13 January 2018. IPCC (2018). The special report on global warming of 1.5°C: summary for policymakers. The Economist (2018). The Nobel prize for economics is awarded for work on the climate and economic growth. Economist Business and Finance article, 8 October 2018. The recent earthquake that occurred in Lombok in August, 2018, presented an opportunity to study the responses of those affected in the immediate aftermath of the event. We find that tourists caught up in disasters are uniquely vulnerable. Few followed the encouraged actions of what to do in the event of an earthquake and most were reliant on local residents and tourist operators for advice. This article summarises the earthquake and how people responded and provides some reflections for policy makers. The island of Lombok is located in the Nusa Tenggara Barat Region of Indonesia. It lies on the boundary between the Australian Plate and the Sunda Plate, which has produced numerous powerful earthquakes in the past. The region is a popular tourist destination, with rapidly increasing numbers of visitors since developed countries lifted travel warnings following the 2002 and 2005 Bali bombings and the SARS (severe acute respiratory syndrome) outbreak between 2002 and 2004. Tourism is a major source of income for Lombok and the neighbouring Bali and Gili Islands, with millions of visitors from around the world each year. The August 5, 2018, Mw6.9 earthquake occurred as the result of shallow thrust faulting on or near the Flores Back Arc Thrust. The earthquake occurred in a subduction plate boundary region where the Sunda and Australia plates converge (USGS, 2018). In the region surrounding the location of the earthquake, there have been six other events of Mw6.5 or larger over the previous century. Four of these are likely to have occurred on the Back Arc Thrust system: a Mw6.5 in the Bali region to the west of Lombok in July 1976 and three events of Mw6.5, Mw6.5 and Mw6.6 in the Sumbawa region to the east of Lombok in November 2007 and November 2009. The Sumbawa earthquakes were associated with several deaths, hundreds of injuries and the destruction of hundreds of houses. This history of recent earthquakes means that locals would have been familiar with the impacts of damaging earthquakes. The earthquake occurred at a depth of 31.0km, centred at the northern tip of Lombok. The local time was 7:46pm. It was preceded by a main foreshock on July 29, 2018 of Mw6.4, and numerous aftershocks including a Mw5.9 event on August 9, 2018 (USGS, 2018). The earthquake caused severe shaking in Lombok and surrounding islands, including Bali and the Gili Islands, and was felt as far as Sumbawa in the east (Cochrane, 2018) and Trenggalek Regency in the west (Solichah, 2018). Following the earthquake, tsunami warnings were issued: however, the maximum expected height was only half a metre and the warning was later cancelled. Most of those affected by the earthquake were in North Lombok, East Lombok and Mataram City. Reports indicated that there were 392 fatalities, 1,353 injuries and damage to 67,875 houses, 606 schools, six bridges, three hospitals, ten health centres, 15 mosques, 50 prayer rooms and 20 office units (Badan Nasional Penanggulangan Bencana, 2018). It is important for emergency managers to have an understanding of human behaviour during extreme events so that they can best develop their plans. In an effort to understand the behaviour of tourists and others following the earthquake, researchers from Risk Frontiers conducted a rapid assessment study utilising media analysis containing interviews with survivors. The method involved locating some 120 news articles sourced from a variety of online international, national and local media outlets. From these articles, interviews with 146 people who experienced the earthquake were extracted and analysed to identify damage that occurred and how people behaved during and after the earthquake. A significant majority of interviewees were tourists (n=102), who conducted interviews with media outlets from their home countries either remotely or after returning home. Other interviews included local residents (n=20) and expats (n=9), with a further ten not stating where they were from. At the time of the earthquake, interviewees were located on the island of Bali, approximately 50km to the east of Lombok (n=54); on Lombok (n=40); on the Gili Islands (n=28) and at other locations in the area (n=3). Twenty of those interviewed did not state where they had been at the time of the earthquake. The interviewees came from a variety of nations, including Australia (n=38), Indonesia (n=25), Britain (n=23), Ireland (n=9), New Zealand (n=8), America (n=7), Singapore (n=5), France (n=4), South Africa (n=3), Canada (n=2), and one interviewee each from Africa (country unstated), Belgium, Denmark, the Netherlands, Malta, Pakistan and Spain. The age of interviewees was captured either by statement in the article or by approximation if a photo was available. Of those interviewed, 99 were categorised between 18 and 60 years old. Three were recorded as above 60 years old, and one was less than 18. Most interviewees said they were with other adult/s when the earthquake occurred (n=51), or with both children and adult/s (n=24). Ten interviewees said they were with someone but didn’t specify their age/s and nine said they were alone. In relation to their location at the time of the earthquake, interviewees stated that they were at a restaurant (n=29), in a hotel (size not stated) (n=14), at home and awake (n=9), in a single storey hotel (n=8), in a multi storey hotel (n=7), at home and asleep (n=3), in a shop or shopping centre (n=3), at the beach (n=2), on a footpath (n=2), in a car (n=1) or on a boat (n=1). Consequences the interviewees observed from the earthquake included collapsed buildings (n=45), debris/objects falling (n=25), injuries (n=23), power cuts (n=22), loss of water from swimming pools (n=15), cracked walls (n=13), food shortages (n=11), deaths (n=11), water shortages (n=6), broken glass (n=4), downed cables (n=4), loss of sanitation (n=2), ground subsidence or uplift (n=1), flooding (n=1) and fires (n=1). Those located in Lombok and the Gili islands observed the most significant damage. During the earthquake, interviewees most commonly reported, of their own behaviour, that they ran outside (n=43). Others reported that they dropped to the ground as they could not remain standing (n=5), sheltered under a table or bed (n=5), ran outside onto the beach (n=4), moved away from buildings (n=4), sheltered in doorways (n=3), deliberately dropped to the ground (n=2) or moved away from trees (n=2). During the earthquake, interviewees observed others most commonly either running from buildings (n=44) or screaming (n=37). Other observed behaviours were crying (n=10), moving away from buildings (n=7), caring for others (n=4), running specifically to the beach (n=4), seeking shelter under tables or beds (n=3), holding onto objects or other people (n=3), panicking (n=3), seeking shelter under doorways (n=2), calling or messaging others (n=2) and dropping to the ground (n=1), reporting they could not stand. Immediately after the earthquake, those interviewed moved to higher ground (fearing a tsunami) (n=29), sought advice on what to do from locals (n=9) or from hotel reception/staff (n=6), gave first aid to the injured (n=4), called or messaged someone (n=4), informed others of tsunami threat levels (n=3), climbed trees (fearing a tsunami) (n=3), searched for family member/s or friend/s (n=3), put on life jackets (fearing a tsunami) (n=2), assisted rescuing trapped person/s (n=2), were themselves incapacitated/requiring treatment (n=2) or extinguished fires (n=1). Interviewees observed that immediately after the earthquake, others moved to higher ground (n=24), were screaming (n=12), panicking (n=11), caring for others (n=10), running (n=5), assisting the injured (n=5), crying (n=5), remaining on the beach (n=4), calling others (n=4), climbing trees (n=3), searching for others (n=3) or moving debris (n=1). People said their actions immediately after the earthquake were directed by local residents (n=9), hotel staff (n=9), local authorities (n=3), other tourists (n=2) or by a minister of religion (n=1). For those interviewees who said they contacted someone, contacts included their parent/s (n=8), other relative/s (n=3), friend/s (n=2), spouse/partner (n=2), children (n=1), authorities (n=1), neighbour/s (n=1) and a stranger (n=1). Six people contacted someone but did not specify who. “Everyone I spoke to just wants to get out but there’s not one free seat out of here today. About 90 per cent of us were westerners and we’re not trained for how to react in this situation.” (Interviewee from a country not prone to quakes) (Darvall and O’Shea, 2018). “It’s scary when the ground is buckling under your feet. My partner and I were out of bed and under the table in a flash and we then immediately evacuated the house. When I was a child at school we had earthquake drills. Best training ever.” (Interviewee from a quake-prone country) (NZ Herald, 2018). Descriptions of interviewees’ emotions during and immediately after the quake included feeling fearful (n=37), panicked (n=14), calm (n=9), concerned (n=7), upset (n=5), terrified (n=5), in shock (n=4), apathetic (n=2), surreal (n=2), and other (n=6). Some 83 interviewees did not state their emotions during and immediately after the quake. Interviewees said they obtained information about tsunami risk from local residents (n=9), the internet (n=6), warning sirens (or the lack thereof) (n=4), social media (n=3), hotel staff (n=2), calling family or friends at home (n=2), other tourists (n=2), local authorities (n=2), observing the ocean (n=2) or overhearing other people (n=2). Over subsequent days, a significant number of people said they evacuated soon after (n=29). Some stayed to assist rescue, medical or relief efforts (n=11), although these were mainly locals and expats. “People were just throwing their suitcases on board and I had to struggle to get my husband on, because he was bleeding.” (Embury-Dennis, 2018). “We just witnessed one of the boats get completely overfilled with tourists climbing on, with the officials trying to keep them back off the boat, pushing them and shoving them. That boat still hasn’t left yet.” (ABC News, 2018). “People are punching and hitting each other.” (Osborne, 2018). Many tourist destinations both within Australia and abroad are susceptible to a range of natural hazard risks. For example, some 26 Australians lost their lives during the Asian tsunami in 2004. Often, many of the elements that make locations aesthetically appealing to tourists are associated with natural hazard risk. For example, warm, shallow seas and sandy islands make idyllic tropical resort getaways, but these places are often at risk from severe weather, while scenic mountain vistas are often the product of tectonic activity which causes earthquakes and volcanism. Tourists are uniquely vulnerable. Tourists may be unaware of risks present at their destination, lack local support networks and encounter cultural and communication barriers. Research has previously shown that tourists behave differently to locals. During evacuations they tend not to shelter with family and friends, but seek shelter at public evacuation centres, simply return home or find another hotel (Drabek, 1999). Observations from the Lombok disaster support such conclusions: in particular, that many tourists simply leave soon after a disaster and are reliant on locals for direction. Many of those interviewed ran from buildings or observed others running from buildings. This behaviour is in conflict with actions encouraged by international and local authorities, which promote the actions of drop, cover and hold. Counter to some research that suggests that people do not panic in the aftermath of disasters (Lorenz et al. 2018), observations from this event show that panic and chaos can occur. This suggests that in more extreme and less predictable events, panic and chaos is likely or that tourists are more likely to panic. Such questions require further exploration. Promotion of disaster risk by travel agents and tourism operators conflicts with wider tourism promotion. The Australian Department of Foreign Affairs does provide some details about natural hazard risk on its Smartraveller website, although more needs to be done than passively informing travellers. There could be an opportunity to engage with the medical profession and travel health clinics to promote natural hazard risk and safety behaviours at the time travellers seek travel health advice. Finally, tourists in Australia are not immune from the impacts of natural hazards, as illustrated by the impacts of Cyclone Debbie in the Whitsunday Region. It is important that tourism operators are engaged regarding disaster preparedness and connected with disaster management structures. ABC News (2018). Witness describes chaos when earthquake hit the Gili Islands. ABC News. 7 August 2018. [Accessed 8 Oct. 2018]. Badan Nasional Penanggulangan Bencana (2018). Korban Gempa Lombok Terus Bertambah, 392 Orang Meninggal Dunia. [online] Available at: https://www.bnpb.go.id/korban-gempa-lombok-terus-bertambah-392-orang-meninggal-dunia [Accessed 31 Aug. 2018]. Cochrane, J. (2018) Powerful Indonesia earthquake kills at least 82. The New York Times. 5 August 2018. [Accessed 10 Oct. 2018]. Darvall, K and O’Shea, M. (2018). ”I just want to get off the island now”: Bondi restaurant owner shares terrifying evacuation footage after earthquake hit Lombok while he was holidaying with his girlfriend. Daily Mail Australia. 6 August 2018. [Accessed 8 Oct 2018]. Drabek, T.E. (1999). Disaster evacuation responses by tourists and other types of transients. International Journal of Public Administrations, 22(5), pp.665-677. Embury-Dennis, T. (2018). Lombok earthquake: tourists “forced to pay to board rescue ships”. The Independent. 6 August 2018. [Accessed 8 Oct. 2018]. Lorenz, D.F., Schulze, K. and Voss, M., (2018) Emerging citizen responses to disasters in Germany. Disaster myths as an impediment for a collaboration of unaffiliated responders and professional rescue forces. Journal of Contingencies and Crisis Management, 26 (3), pp.358-367. Osborne, S. (2018). Lombok earthquake latest: tourists flee Indonesian island after powerful magnitude-7 quake kills at least 98. The Independent. 6 August 2018. [Accessed 8 Oct. 2018]. Solichah, Z. (2018). Warga Jember dan Banuwangi rasakan gempa Lombok. Antara News. 5 August 2018. [Accessed 10 Oct. 2018]. USGS (2018). M 6.9 – 0km SW of Loloan, Indonesia. [online] Available at: https://earthquake.usgs.gov/earthquakes/eventpage/us1000g3ub#executive [Accessed 31 Aug. 2018]. NZ Herald (2018). New Zealanders in Indonesia describe the violence of Lombok earthquake. NZ Herald. 8 August 2018. [Accessed 8 Oct. 2018]. A second earthquake with magnitude larger than 5 occurred today (November 9, 2018) near Lake Muir in southwestern Western Australia, and Geoscience Australia assigned it a magnitude of 5.4. This earthquake, shown by the large red dot in Figure 1, occurred about 10 km southeast of the magnitude 5.7 earthquake that occurred on 17 September 2018. The aftershocks of today’s earthquake, shown by small red dots in Figure 1, are located at the southern end of the aftershock zone of the September 17 event, shown by the yellow dots. Today’s earthquake was preceded by a series of foreshocks that occurred overnight, and was felt between Albany and Perth. The shaking intensities of the two earthquakes are shown in Figures 2 and 3. The orientation of the fault plane on which the 17 September earthquake occurred is shown on a Wulf net projection in Figure 4. This shows that the earthquake had a thrust mechanism on a fault plane striking east-northeast. The InSAR (interferometric Synthetic Aperture Radar) map in Figure 5 shows that the west side moved up and the east side moved down on a plane dipping down to the west-northwest. The change in elevation along this dip direction is shown at the upper left of Figure 5. Figure 5. Uplift on the west side and subsidence on the east side of the fault that caused the 17 Sept 2018 earthquake. The uplift and subsidence profile along the line A-B as shown in the inset at top left. The two earthquakes are shown by the yellow stars on a map of historical earthquake epicentres in the Southwest Western Australia Seismic Zone (SWWASZ) in Figure 6. The contours show annual probability of events of magnitude 5 and above from QuakeAUS6. The two earthquakes occurred on the southwestern edge of the SWWASZ.